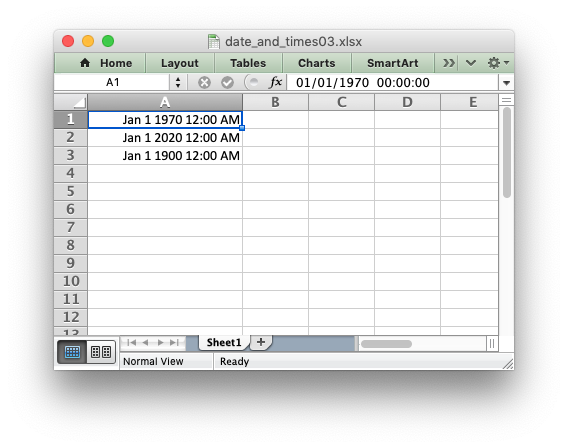 Dates and times in Excel are represented by real numbers. For example a date that is displayed in Excel as "Jan 1 2013 12:00 PM" is stored as the number 41275.5. The integer part of the number stores the number of days since the epoch, which is generally 1900, and the fractional part stores the percentage of the day. To make working with dates and times a little easier the libxlsxwriter library provides the lxw_datetime struct and the worksheet_write_datetime() function. Dates in Excel do not support timezones and the maximum resolution of times is milliseconds. The output from this program is the same as the previous example. * the format strings changes the appearance of the date.